Tynelle Gumbs followed up teammate Kyron McMaster’s 400m victory, by shattering the National Jr. Colleges Athletics Association Indoor Championships Weight Throw record, leading all five of the territory’s athletes competing to top 10 finishes in their respective events. The Mar 4-5 championships were held in Winston-Salem, North Carolina. Representing Central Arizona College and competing in the same event with twin sister Trevia who took the lead in the competition with her opening throw and personal best of 19.08m, Tynelle went to work in the second round where she seized the lead for good, with the first 20m throw of her career. Tynelle’s 20.08 mark, demolished Barton County’s Ariel Brooks’ 19.55m championships mark that stood since 2004. She extended the mark to 20.28 in the third round but, still was not done. 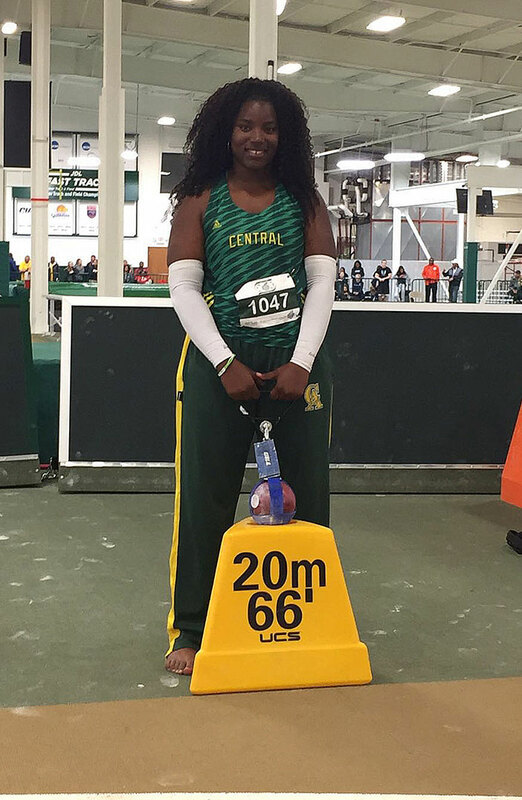 The sophomore had a throw of 19.82m in the fifth round before unleashing a 20.91m Jr. College record on her final attempt. 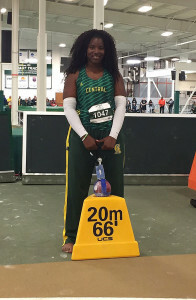 With her sister finishing third and Trinidad and Tobago Portious Warren placing fourth, Central Arizona picked up 21 points in the event and finished fourth in the final team standings with 85½ points. Tynelle said when Trevia opened with 19.08 to take the lead, she was excited for her as it increased her personal best from 18.28m. “The main aim was just to keep her relaxed so she could have a bigger throw,” she said. While Tynelle and Trevia were in action, McMaster won the 400m in 47.95 seconds. The freshman ran 48.59 to win his heat with the second fastest time of the prelims. He anchored the 4x400m Relay to a fifth place finish in 3:16.97, helping Central Arizona to place third with 72 points. Plagued by foul troubles, Eldred Henry who had the top billing in the Shot Put heading into the competition, had to settle for fifth place with a throw of 16.90m after fouling four of his six attempts. He also fouled his last four attempts and wound up ninth in the Weight Throw with a 17.00m mark. South Plains College freshman Taylor Hill, was eight in the 60m dash in 7.68 seconds. She advanced to the final after running 7.62. She was second in her 200m heat in 25.41 seconds but did not advance to the final. At World’s Last Chance meet in New York, Tahesia Harrigan-Scott won the 60m dash in a season’s best of 7.20 seconds, followed by Karene King in 7.53. Harrigan-Scott ran 7.33 in the prelims and King, 7.58. Tarika “Tinker Bell” Moses ran the third best 400m in or outdoors when she placed second in 53.76 seconds.